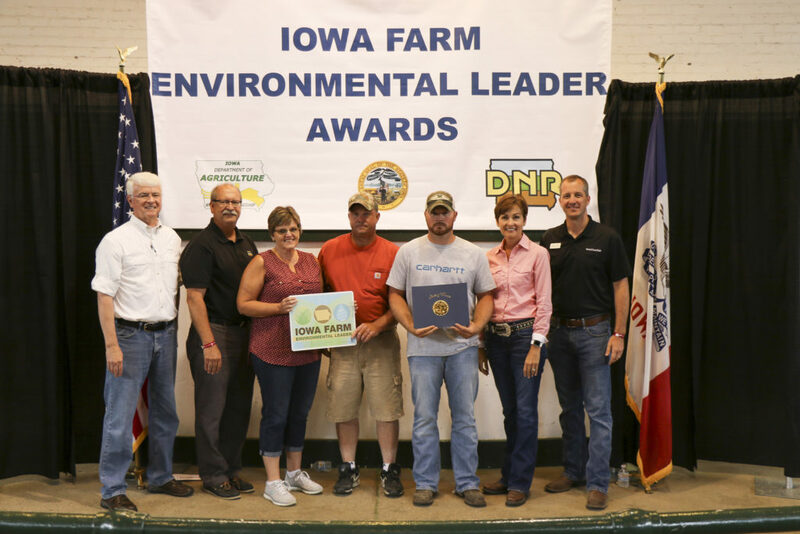 The Allamakee SWCD would like to congratulate Scott, Karen, and Dylan Ness on receiving one of the Iowa Farm Environmental Leader Awards at the Iowa State Fair on August 15. The award is a joint effort between the Governor, Lt. Governor, Iowa Department of Agriculture and Land Stewardship and Iowa Department of Natural Resources to recognize the efforts of Iowa’s farmers as environmental leaders committed to healthy soils and improved water quality. Winners were nominated for the award. This award recognizes the exemplary voluntary actions of farmers that improve or protect the environment and natural resources of our state. These influential environmental leaders also encourage other farmers to follow in their footsteps by showcasing the success that hey have had. It recognizes those that have taken steps in their farming operations to serve as local leaders in environmental stewardship on their farms, utilizing a variety of techniques and best management practices. As environmental leaders, these farmers have adopted best management practices and incorporated environmental stewardship throughout their farming operations. As true stewards of the land, these awardees recognize that improved water quality and soil sustainability reap benefits that extend beyond their fields to reach the citizens of Iowa and beyond, and have made environmental stewardship a priority on their farms. We thank them for their efforts. ← Cover Crops: What to plant?